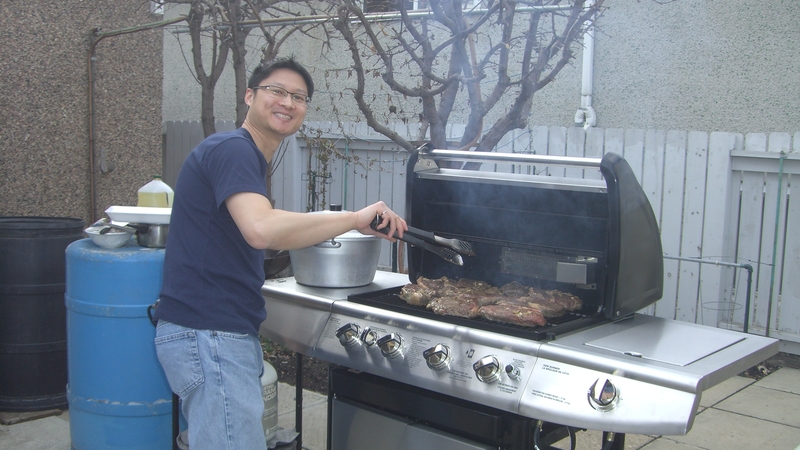 Thank you to those of you who replied and/or emailed me about my cookware question. Your advice and comments were very helpful and I will take all of them into consideration when I make my choice on which one to buy. Anyways, I’d like to share some random food thoughts I had throughout the week with you . My parents had a couple of boxes of these at their salon for their customers so I decided to try a pack. 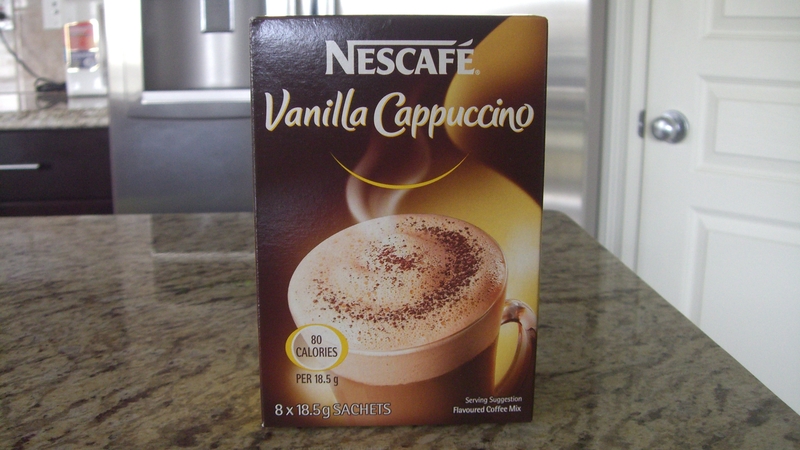 Now I don’t consider myself a coffee drinker but ever since my first instant bag of this frothy yumminess, I was hooked. Neither my hubby nor I drink coffee so we don’t have a coffee maker and we’re too cheap to buy a fancy espresso or cappuccino maker. But we do love this machine. Can you spot my OCD in this picture? 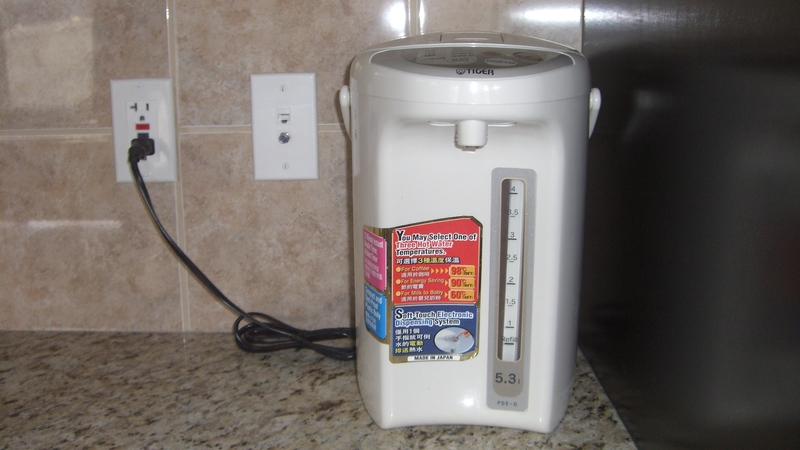 If you’re Asian, you either have one of these in your home or have a relative who has one. We actually got this machine when Kayla was born to heat up her milk bottles. Instead of spending money on a bottle warmer that we’d probably use for only a year, we opted to buy this instead so we could continue to use it years down the road. 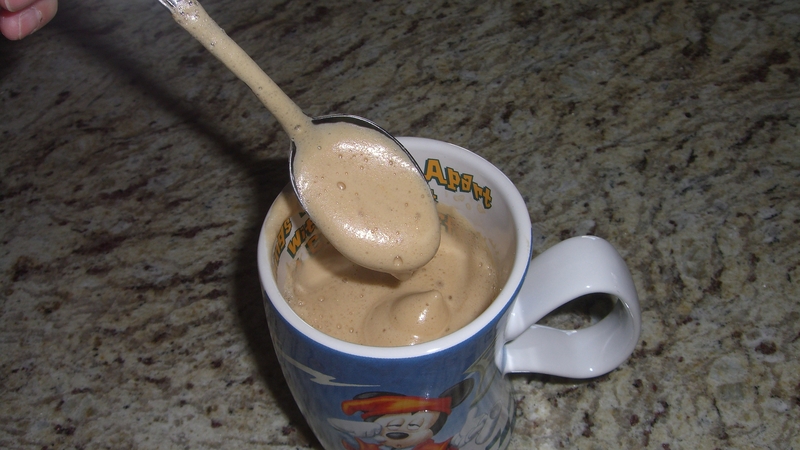 I love the fact that at the press of a button I have instant hot water for tea or now my instant FROTHY cappuccino. We had the pleasure of visiting Vietnam about 3 years ago. 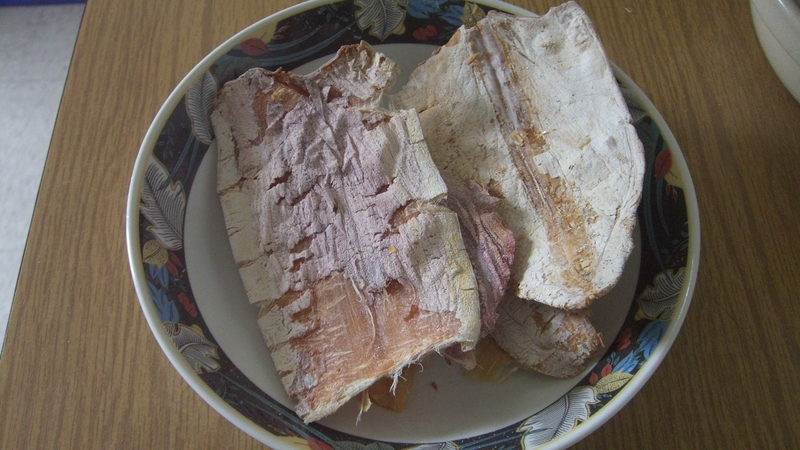 It was there that I was introduced to a coconut dessert that I’ll never forget and till this day am still searching for anything that comes close to it here in Canada. 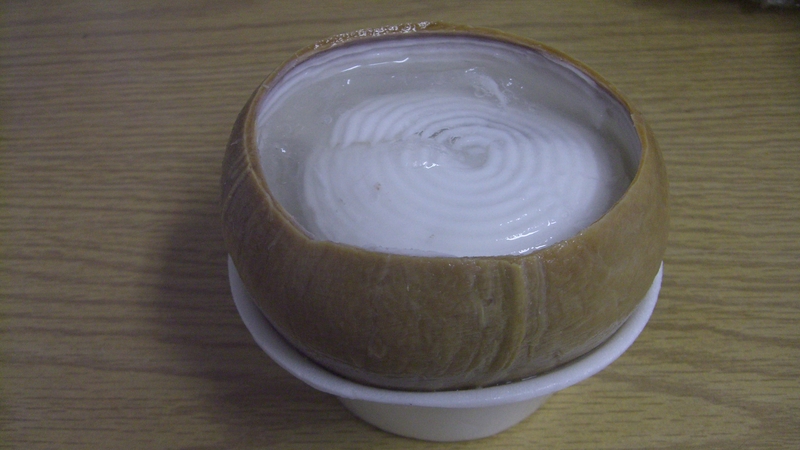 Basically it’s a young coconut filled with coconut juice and coconut jelly dessert. If you’ve been to dim sum and have ordered those white cubes of coconut milk desserts then you’ll know what I’m talking about. 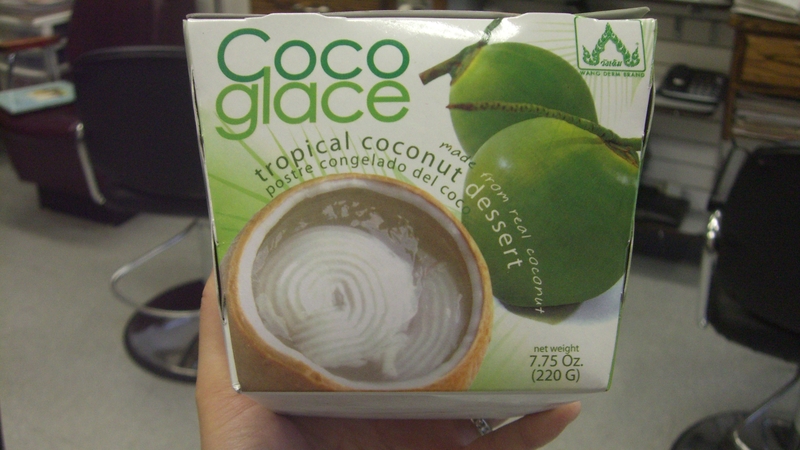 Oh yummy coconut dessert, when will we meet again? This is the closest thing I’ve found here. 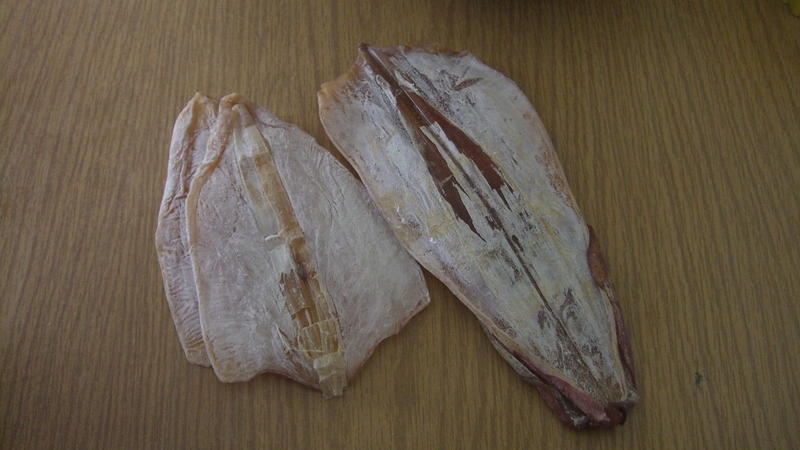 Dried squid. Have any of you tried these before? These actually came from Vietnam. We have some friends visiting us from there this month and they brought some over for us. Pop these babies into the mini oven at 375 degrees F for about 5 mins or until they curl up into a tube and you’ve got yourself some dried deliciousness. 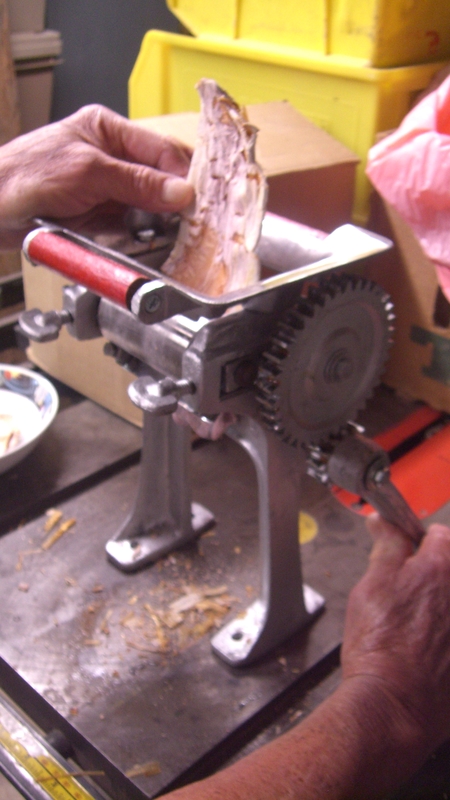 We love eating these so much that my parents actually got a machine from Vietnam that compresses and rolls out the squid to make it more tender. It’s almost like a pasta roller. So how do you eat these? Rip into shreds and pop them in your mouth. I like to eat these squid plain, without any dipping sauce but my parents like to mix hoisin sauce, shredded carrots, and chili sauce to use as a dip. I should warn you though, once heated in the oven your house is going stink. Thank you for all your comments on the last post. As always, I enjoyed reading all of them. 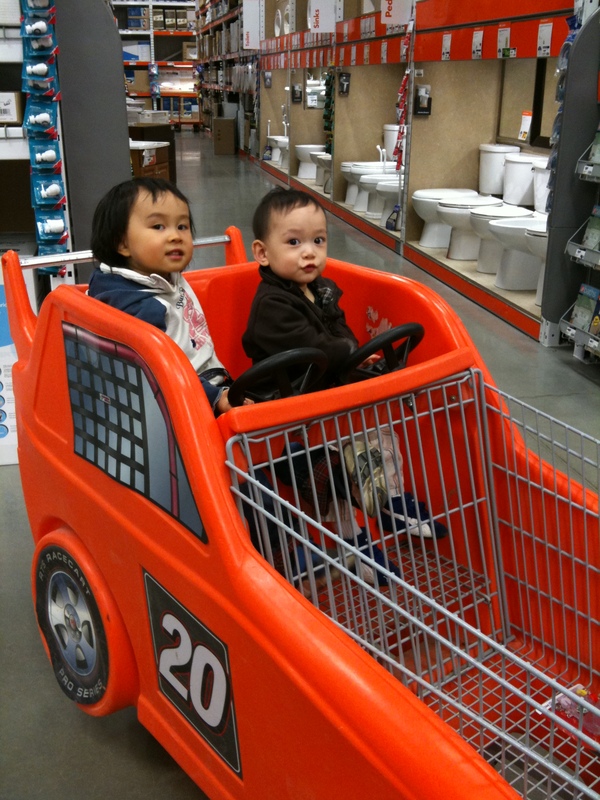 This weekend we did some Costco shopping. 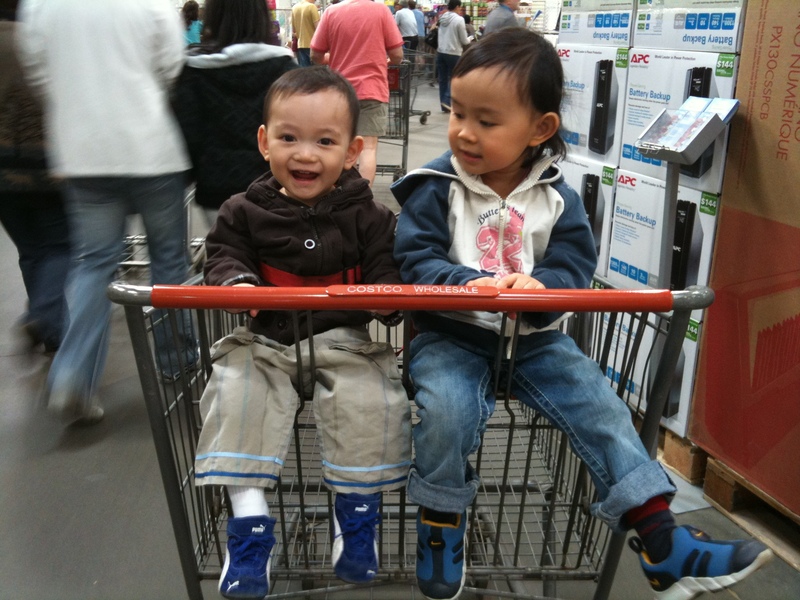 My kiddies love it when we go to Costco cause that means they get to eat samples. I’m not going to lie, I get excited going to Costco too 😉 Yes, I live such an exciting life. Do you think Lex knows he’s at Costco? 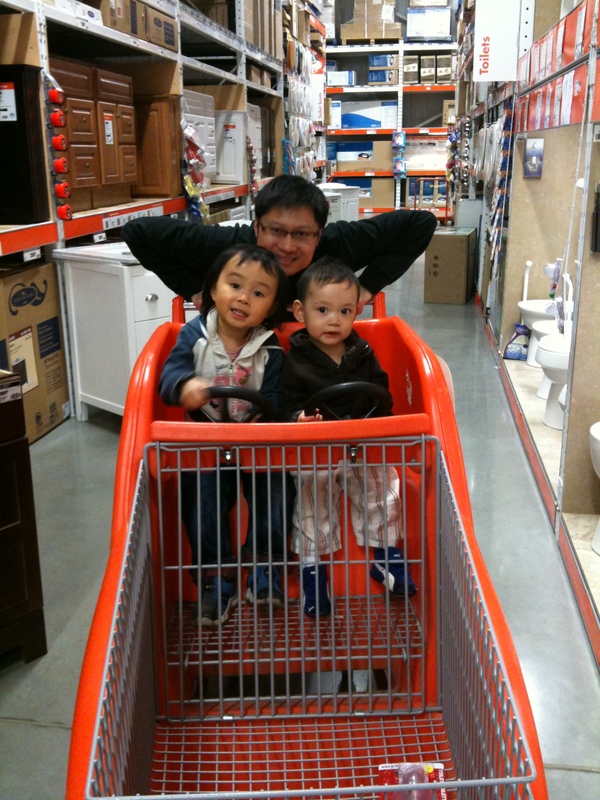 We also dropped by the Home Depot (again, exciting life). That has to be the most boring place for kids to go to. 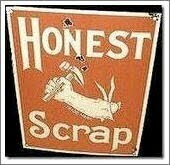 I used to hate going to those places with my Dad. 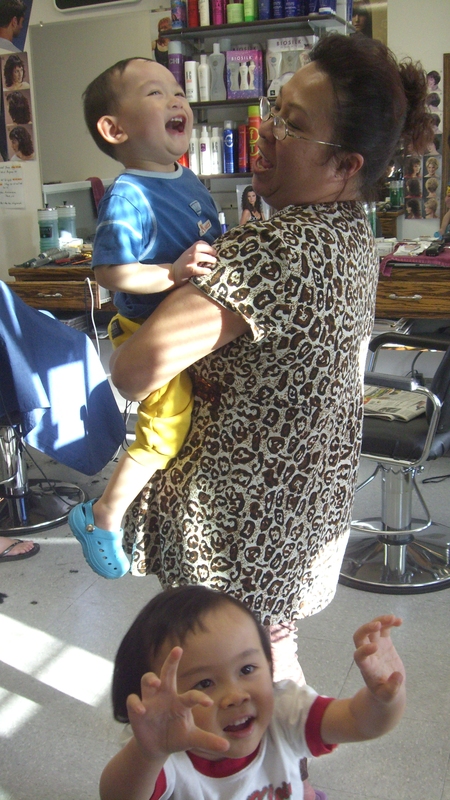 And now it’s my turn to drag my kiddies there. But then some genius came up with this brilliant shopping cart idea. LUV LUV LUV these! 😀 I haven’t been to the Home Depot in a while so this is new to me. Whoever thought of this, THANK YOU! We also visited Grandma and Grandpa. 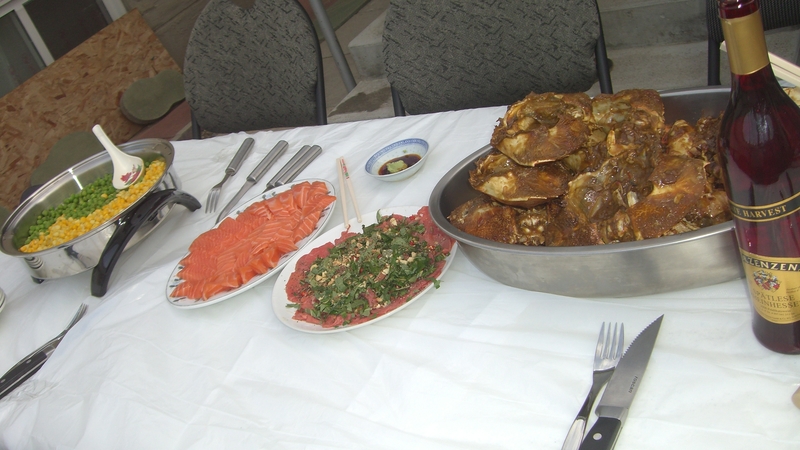 And we had brunch a the River Cree. This is our go to brunch place. 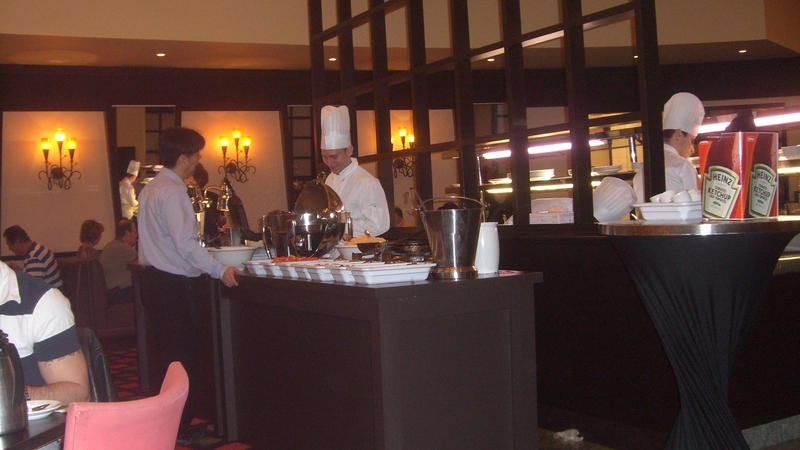 Here’s their rack of lamb, waffles, and omelette station. Gary loves their rack of lamb, but I’m really picky when it comes to meat so I usually pass on these. I just can’t stand the smell and the gamey taste of lamb. Although Gary does say that their lamb is not gamey at all and that it’s quite succulent, tender, and cooked to perfection (medium rare). Everyone we’ve taken to this brunch seemed to love these as well. 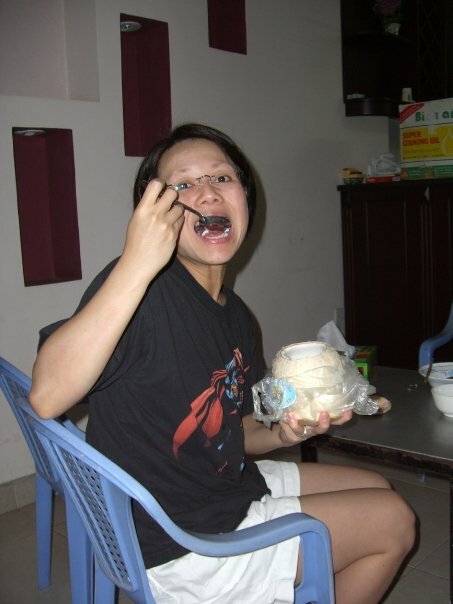 I can stand the smell of durian but not lamb…hmmm…go figure. 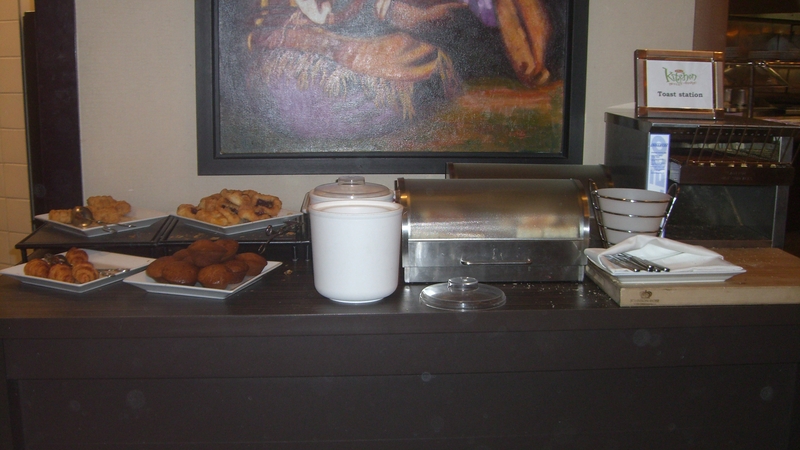 They also have a bread station which includes croissants, bagels, muffins, strudel, bread (of course), and a toaster. 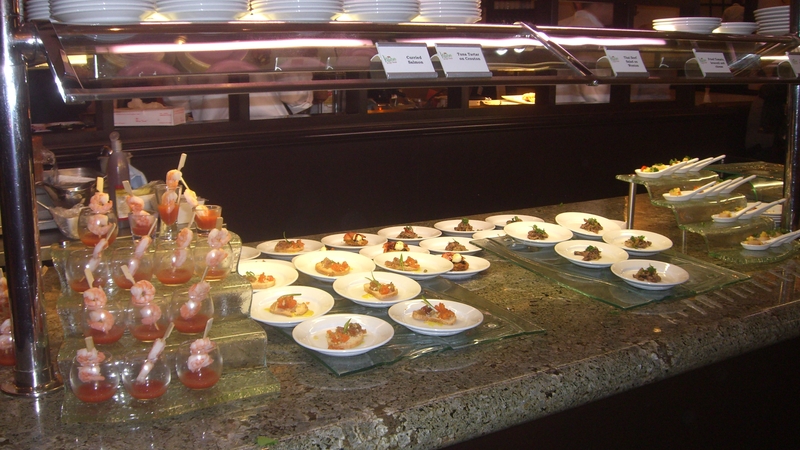 Here’s their appetizers station. Be warned though, this changes every week. So if you do decide to give this brunch a try and then decide to bring some friends on another weekend, don’t expect to have the same appetizers. Right beside their appetizers they have a salad station as well but I forgot to take a picture of that. 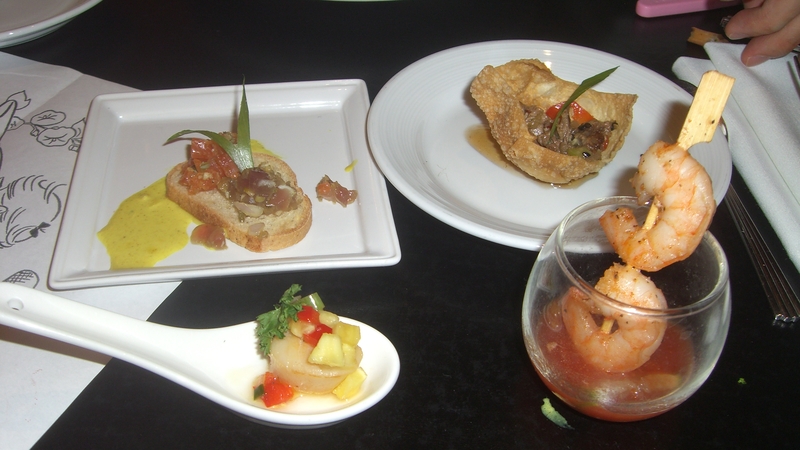 From top left going clockwise: scallop and pineapple salsa, tuna tartar on crouton, Thai beef salad on wonton, and shrimp cocktail. Sometimes on my lucky days they even have lobster sashimi. I couldn’t get a good picture of their main cooked food station cause there was always a huge line up so I’ll show you pics of some of our plates instead (sorry). 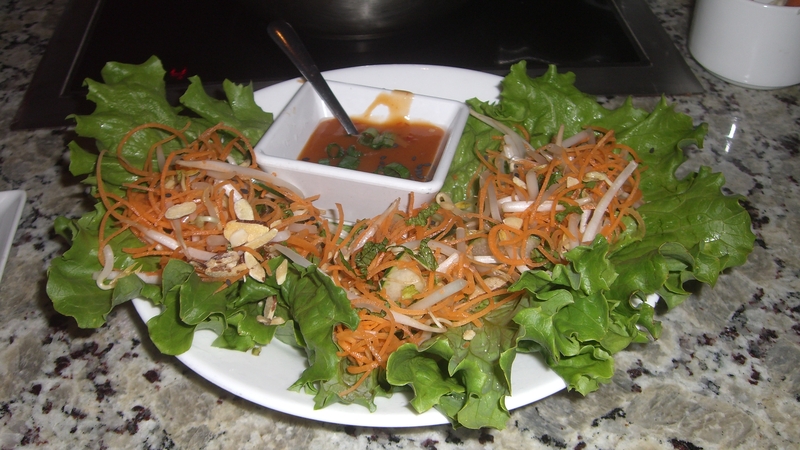 Here are some mixed greens and some kind of raspberry dressing which I tried for the first time. Not bad. Wasn’t as raspberry-ey (yes, I’m just making up words) as I expected though. I’m still on a search for a favorite dressing when it comes to salads. What’s your favorite salad dressing? Any suggestions? 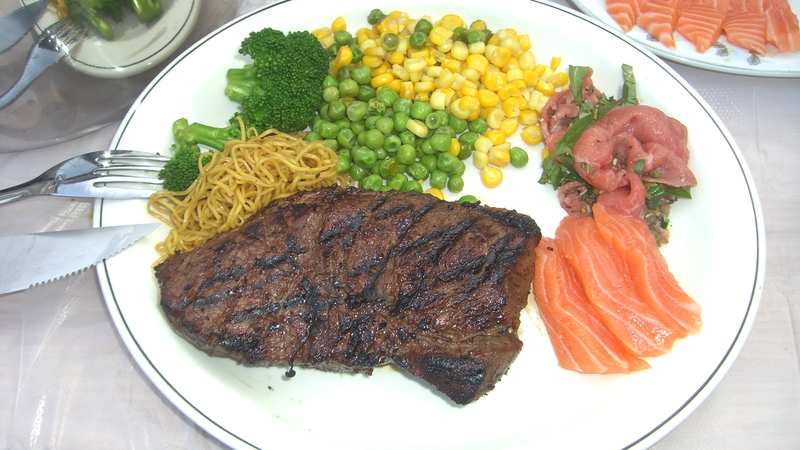 Here’s one of Gary’s plates. Yes, I said one of. 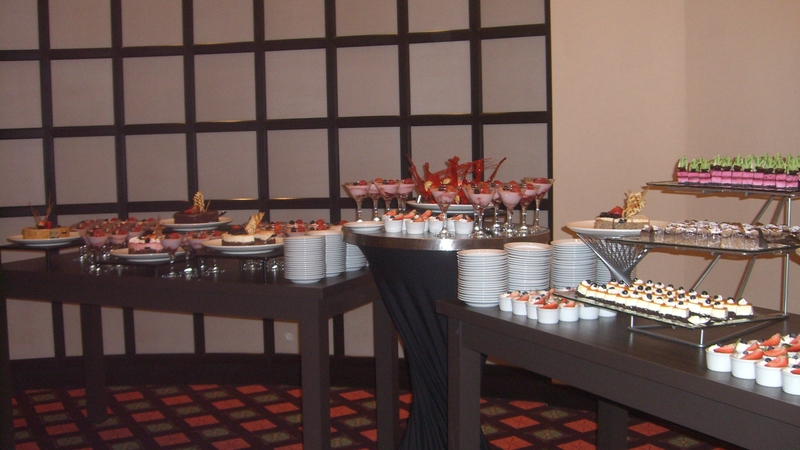 I don’t bother keeping track of how many plates dude eats at buffets anymore…sigh. Oh and I guess I should mention that this is an all you can eat brunch buffet. If I remember correctly he had scallops, halibut, smoked salmon, prime rib, shrimp, rack of lamb, and some kind of pork all on that one plate. Don’t worry, he did get a plate of vegetables, salad, and fruits as well later. 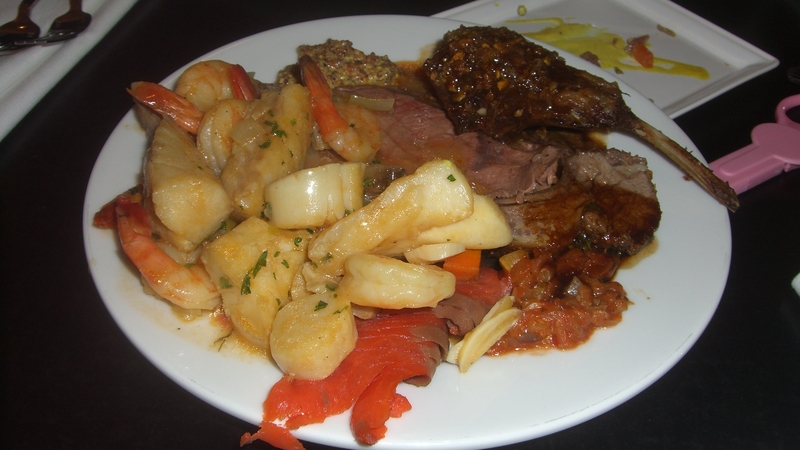 Other cooked items included in this buffet but not shown here were salmon Wellington, eggs Benedict, hash browns, bacon, oatmeal, and vegetables. 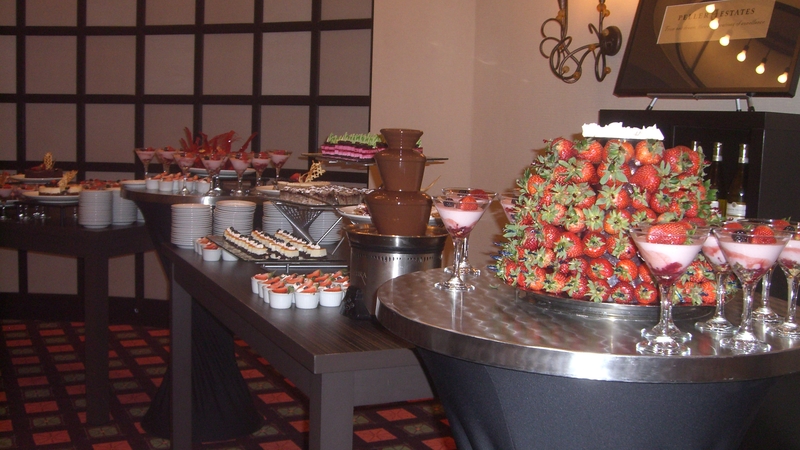 Yup yup, that IS a chocolate fountain you see. They have a beautiful selection of desserts but this also changes every week. And the thing I love about this buffet is that they are kid friendly. So how much does it cost? It used to be $25.95 per person but they raised it to $27.95. I blame Gary, I think he single-handedly raised their price by eating so much…teehee. 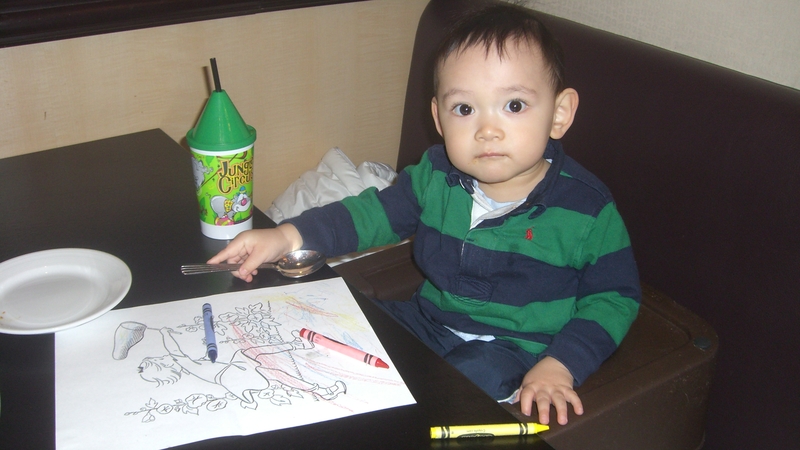 All non-alcoholic drinks are included in the price and kids under 5 eat FREE. I love that word 😀 Considering the number of plates of lamb Gary eats, and the amount of seafood they have, we think it’s worth the price. Aaack! I almost forgot to mention that if you go and sign up for a Player’s Club membership card, you get a 20% discount. So it actually works out to about $22.50 per person with the discount. Click here if you want more info. I’ve been meaning to post this earlier but since the weather has gotten so much nicer, it’s only fair to take the kiddies out more. 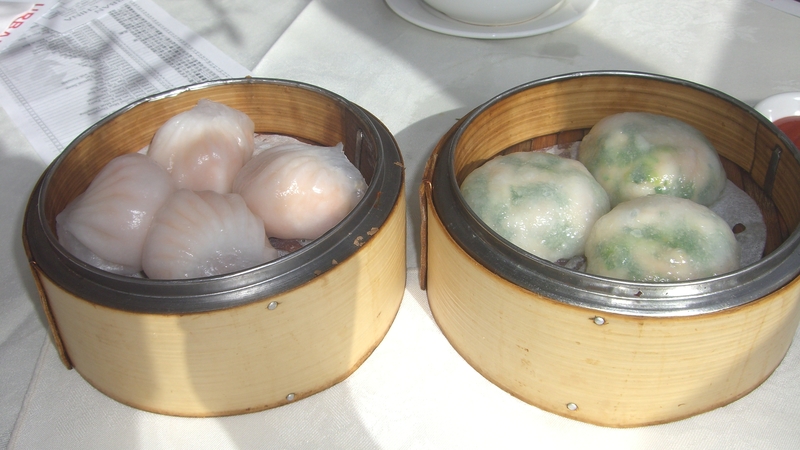 Gotta take advantage of the 2 months of really great weather us Canadians only get 😉 My in-laws came into town from Vancouver so we tried out a dim sum place in Chinatown called Urban China. 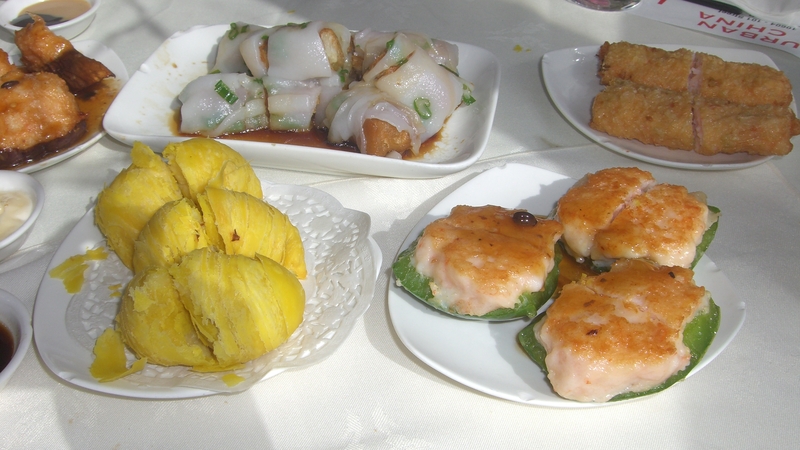 Those eggplants are my fave at dim sum. And we usually order anything and everything with shrimp. These durian pastries were mmm…mmmm…good 😛 I almost had the whole plate to myself. 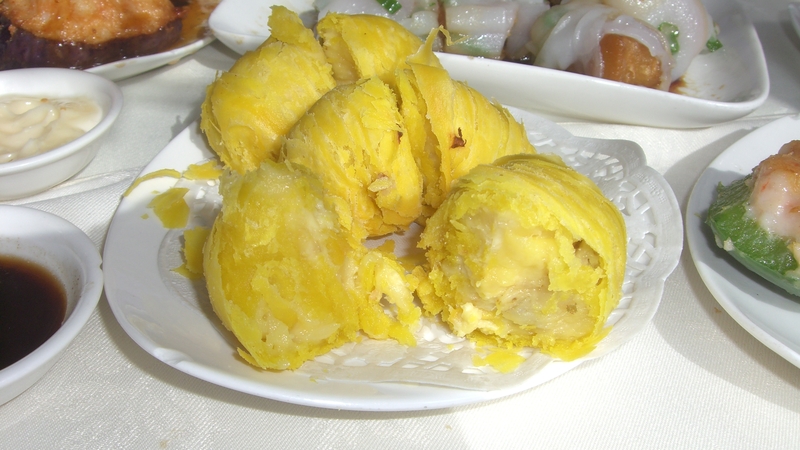 Durian is definitely one of those you either really hate it or really love it type of food. We thought the food was pretty good but the service was lacking a bit. I’d probably go again though. Yes, if you’re retired and have absolutely nothing to do but wipe every leaf on your plant then this is pretty cool. But if you’re like me and think your time could be better spent on MANY, MANY other things then yes, this is pretty crazy. Oh and I’m no expert on plants so please try this at your own risk. Not sure if the banana juice would be harmful to the leaves or not. I don’t see why it would be though. Anyone know? 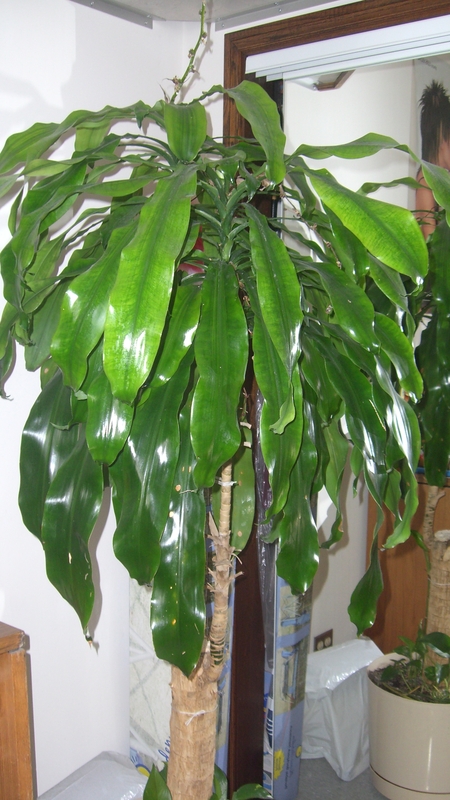 My Dad wiped his plant once about 2 months ago and this is a very recent picture. Oh and another great thing is that he says it keeps the dust off too. Just thought I’d share. Anyways, I never shared my birthday meal with you so I’ll let the pictures do the talking. We decided to have a barbecue at my parents’ house so I made sure I wore my eating pants 🙂 When we barbecue, Gary is usually in charge of the grill. “Be a man, do the right thing.” Sorry, that Russell Peters quote just popped in my head for some reason. 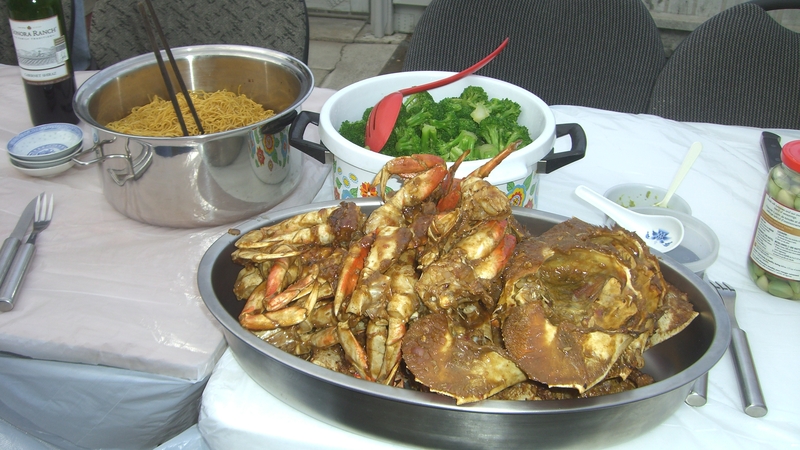 My sister in-law was sweet enough to make tamarind crab for us. She didn’t want to be in the picture. 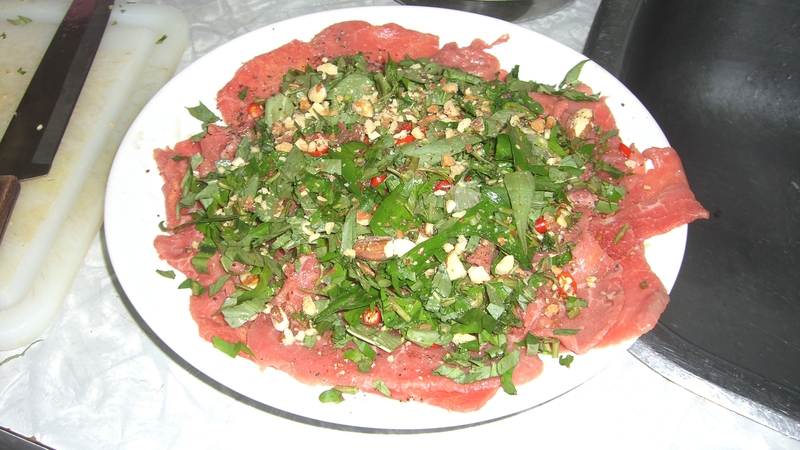 A plate of beef sashimi with a Vietnamese twist. Chopped up mint leaves, red chili peppers, crushed peanuts (which I had to pick off), the juice of a lime, and salt and pepper to taste. Sorry if this grosses some of you out. 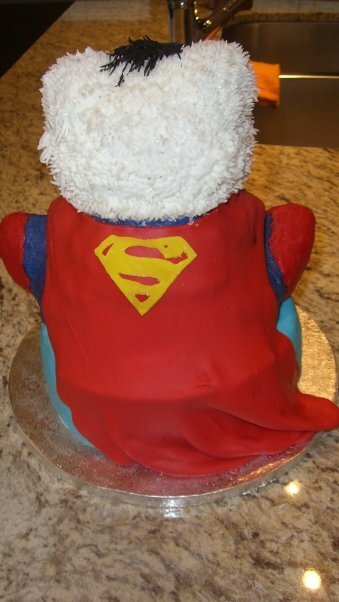 No birthday cake for me this year. 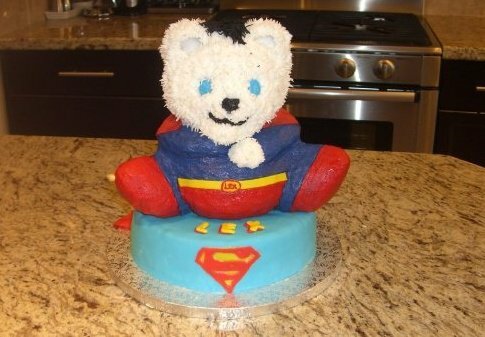 But after all that pigging out, I’m not sure if I would’ve been able to eat cake. Hope you’re all having a great week. Don’t forget to check the giveaways page as I just added some new ones today. Untill next time friends and family. Hello everyone! First of all, thank you soooo very much for all the birthday wishes. It made my day just reading all your lovely comments. I had a wonderful time with friends and family that day. And what’s better than to start my birthday week off receiving an award and ending it receiving two more awards? It definitely was a great day! Hope everyone else had a nice weekend. So on with business. I am so honored to have received this award from the lovely Cindy @ This Adventure, Our Life. 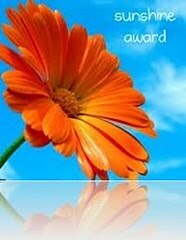 Congratulations for receiving this award Cindy and thank you so very much for passing it on to me. 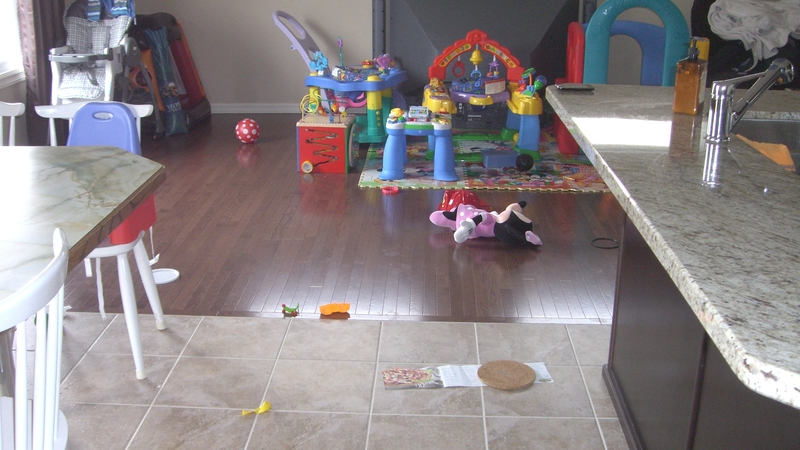 Cindy has an excellent blog where she compiles the most beautiful writings about her cute as can be daughter Bailey, their exciting family adventures, and useful tips for the many young mothers like me out there (young referring to experience, not age…haha). Her blog brings a smile to my face everyday and I’m so glad to have met such a wonderful friend in the blogging world. 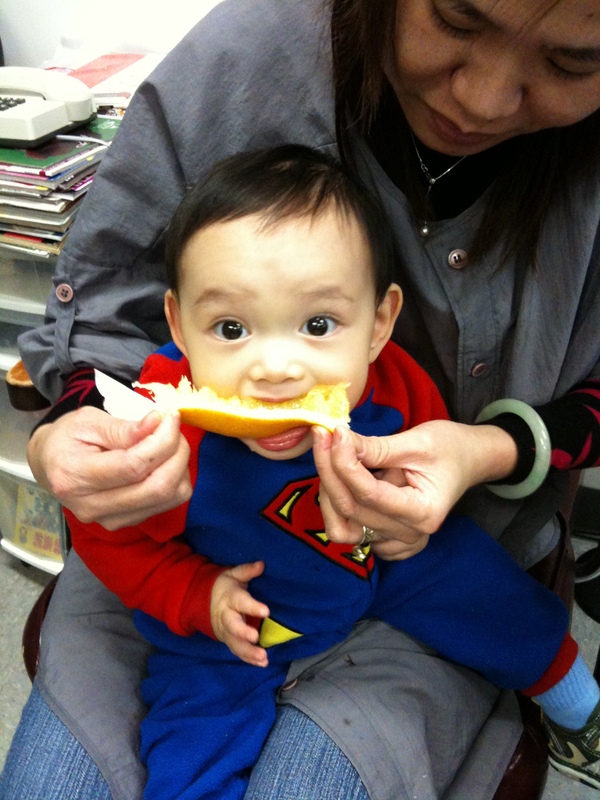 Please stop by her blog to say hi and meet this little cutie (her daughter Bailey, but Cindy’s cute too…teehee). I must now share 10 things about myself and pass it on to 8 other lovely bloggers! I’m a huge sucker for TV infomercials. My #1 movie of all time is Saving Face. I’m a snake in the Chinese zodiac but have a huge phobia of them. I speak English, Cantonese, and Chu Chow (another Chinese dialect) fluently and can understand Vietnamese and some Mandarin but can’t speak those very well. Thank you to these bloggers for always being straight forward and honest, whether it be on their blogs or commenting on mine. Please do not feel obliged to participate. I just wanted you to know that I appreciate your blogs and your honest opinions. 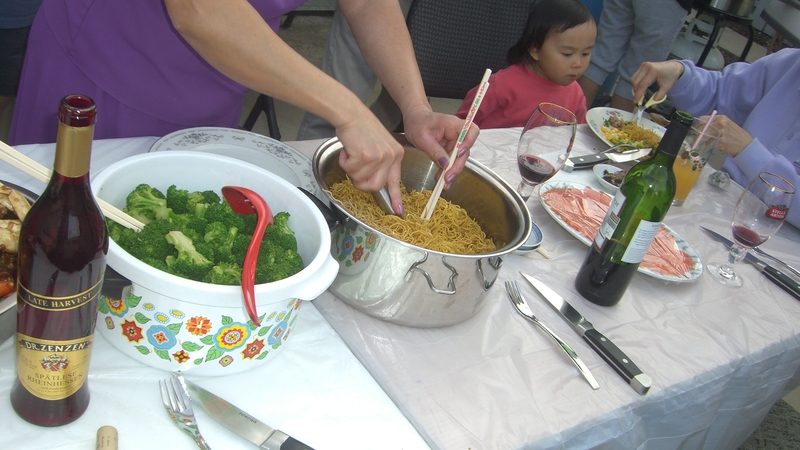 Another award comes to me from Denise @ Quickies on the dinner table. Congratulations on receiving this award Denise and thank you so very much for passing it on to me as I know there are many others you could have chosen. Denise is the author of the book Quickies Morning Noon & Night. It’s not what you think people, get your minds out of the gutter, haha. Having seen some of Denise’s mouth-watering recipes, I’m itching to get my hands on her book. Not only is she a great cook, but she’s also great in supporting her fellow bloggers. Denise truly gets to know the person behind the blog by taking the time to comment, question, and reply back to others on their blogs as well as her own. She is definitely “the real deal” when it comes to meeting true blogger friends! Drop by and say hi if you get a chance. The Sunshine Award is given to bloggers who are deemed warm, inspirational and positive, hence the beautiful sunflower which symbolises it. Pass the award on to 8 bloggers! Thank you to these lovely bloggers for the warm comments left on my blog, the inspirational dishes you make (which are so out of my league :-P), and the positive attitudes you have when things go downhill. Once again, please do not feel obliged to participate. I just wanted you to know that I appreciate your blogs and comments. Cindy and Denise, I hope you don’t mind me changing the number of bloggers to 8 and 8. I thought that seemed like a nice round, balanced number. 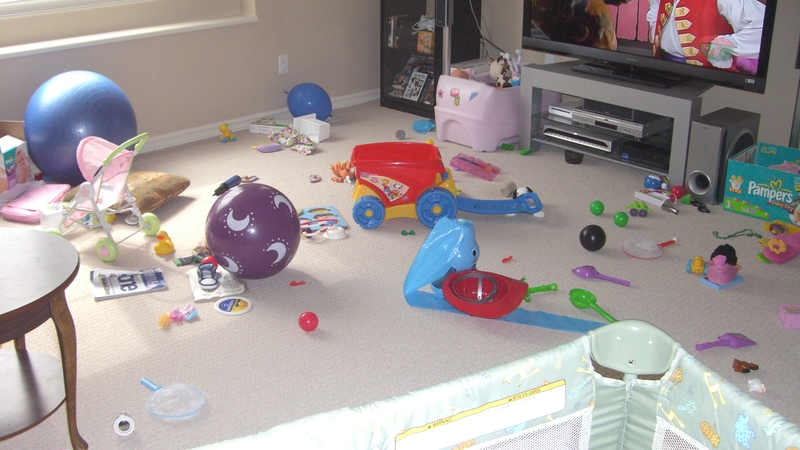 But then again it could be the OCD…haahaa. And thank you to the both of you again for thinking of me 😀 I’m blessed to have such warm and sincere bloggie friends like the two of you. Well that’s all I have to say for today. Hope everyone is having a great start to their week. Untill next time friends and family. I’m off to spread the love. Yipee! 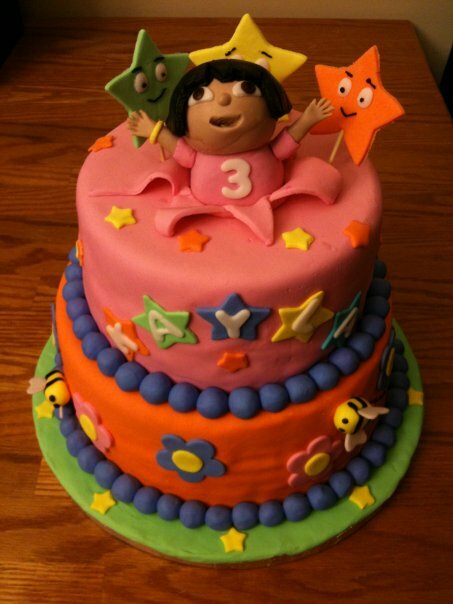 It’s my birthday today! Happy happy joy joy! I’m so glad my birthday falls on a Saturday this year because that means I get to spend my whole day with the hubby and kiddies 😀 Plus, my in-laws are coming into town to celebrate with me too. How cool are they?! The hubby and I knew we wouldn’t be alone this weekend so we decided to celebrate last weekend. 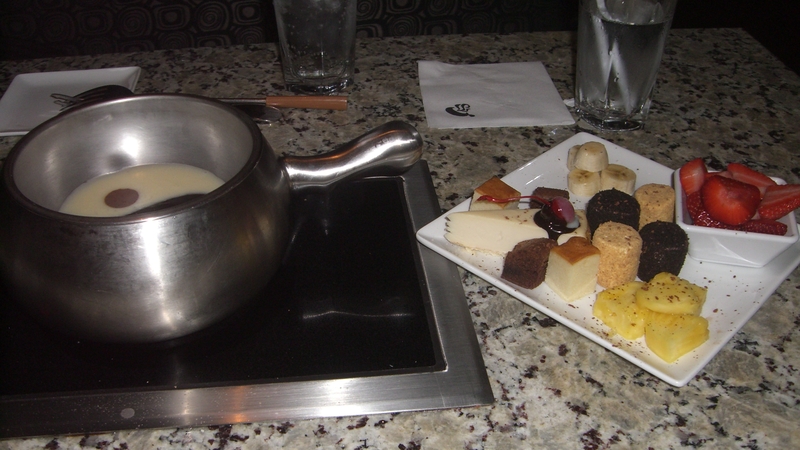 Have any of you ever heard of The Melting Pot? 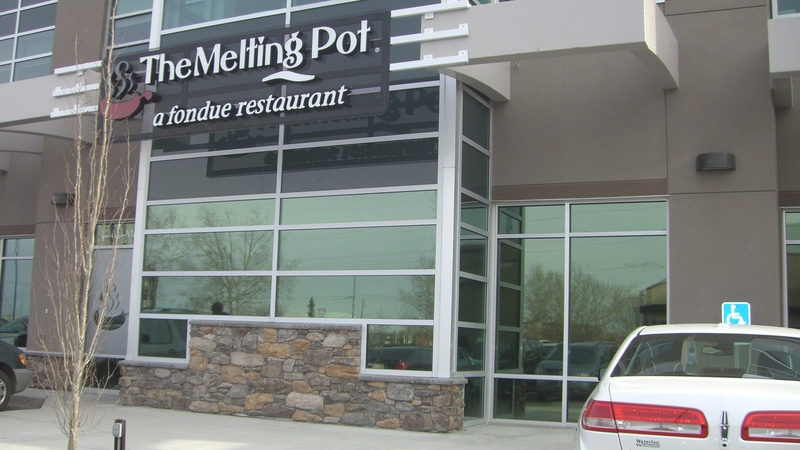 This is Edmonton’s newest fondue restaurant. It may be old news to those of you in the States but this restaurant just opened about a month ago here so we decided to give it a try. Apparently we’re also the first and only city in Canada (so far) that this American franchise has opened in. Gary and I decided to order the Big Night Out. 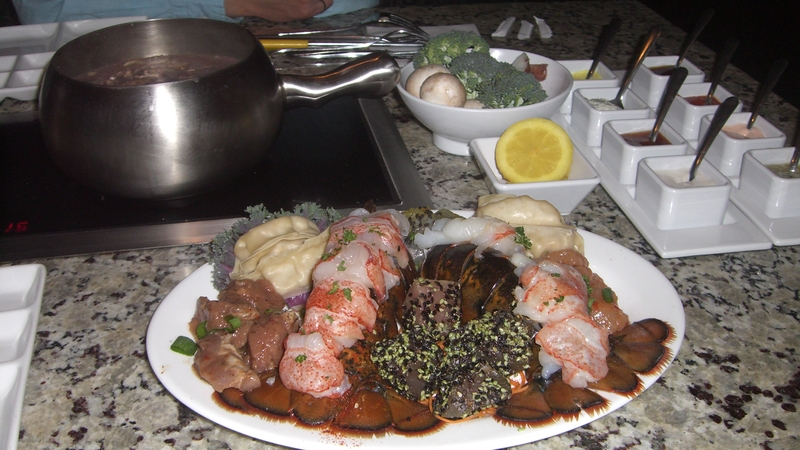 This was a set four course meal which included a Feng Shui cheese fondue, lettuce wraps, an entrée big enough for two people to share, and a chocolate fondue. If you’re interested in the menu and prices click on this link and then menu. Our first course was called the Feng Shui Cheese Fondue. 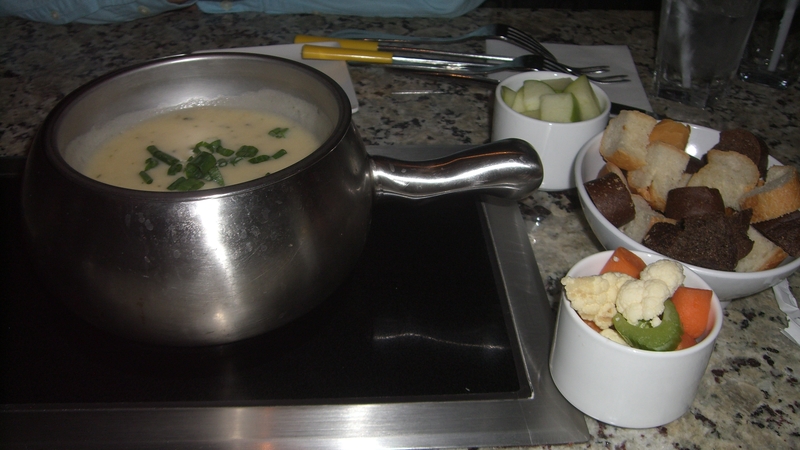 The ingredients of the fondue included white wine, mirin, sake, Gruyere cheese, horseradish, and chive Havarti. Along side the fondue the server also brought us some Granny Smith apples, carrots, celery, cauliflower, and bread to dip. The Granny Smith apples were my favorite as the acidity helped to mellow out the rice wine. Everything you see in the picture below was to share between the two of us. Our entrée came out with this little contraption. Guess it was just to keep the broth from spilling. 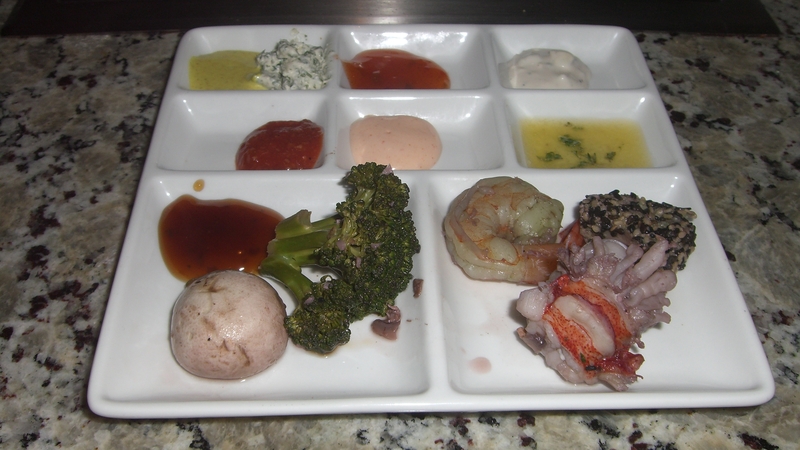 For the entrée you get to choose one of four cooking styles. We chose the Coq au Vin which included herbs, mushrooms, garlic, spices and burgundy wine. And we went with the Lobster Indulgence for the third course. This dish was to be shared between the two of us. 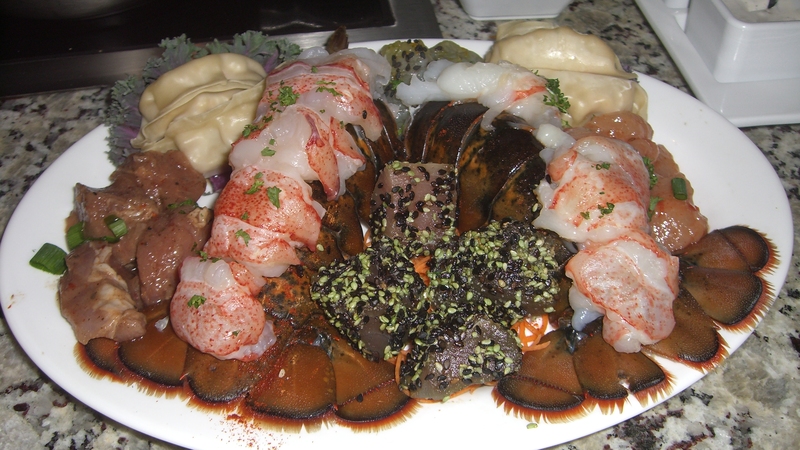 It included two lobster tails, citrus-infused pork tenderloin, Ahi tuna, garlic chili chicken breast, kiwi lime shrimp, vegetable dumplings, potatoes, cauliflower, mushrooms, and broccoli. 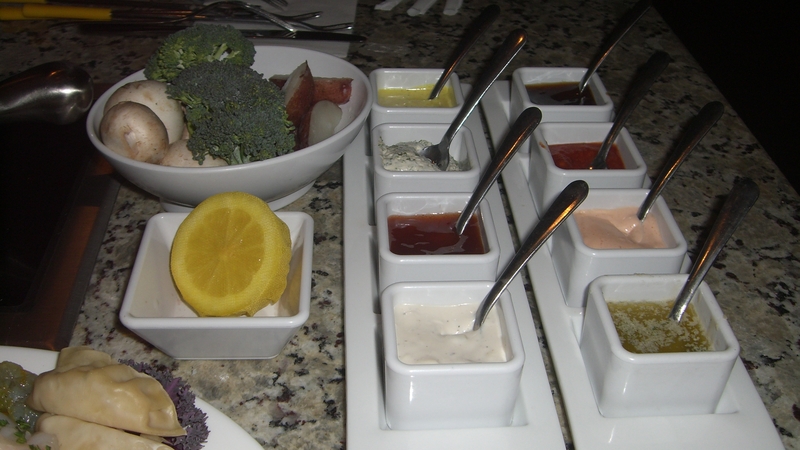 It also came with an array of dipping sauces. Sorry, I can’t remember any of the names. The plate that they bring you is perfect for this entrée. I was a little disappointed with this entrée as it’s supposed to be the main dish but I found that the food was a bit bland. The lobster was the biggest disappointment due to the lack of succulent seafood taste. 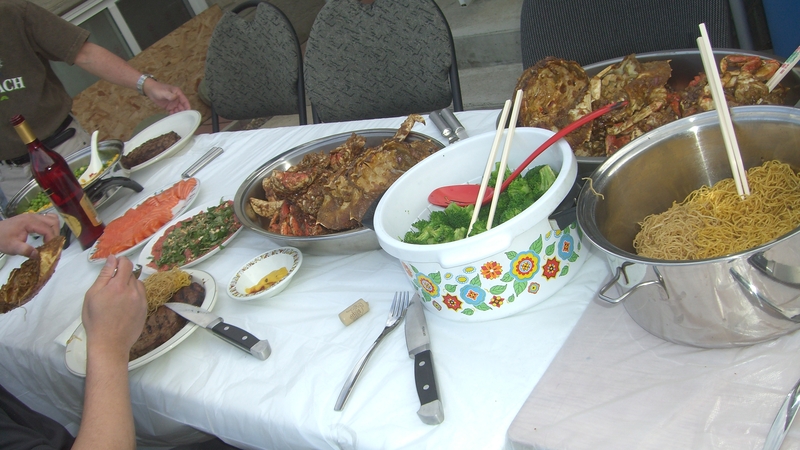 I could have steamed a lobster at home and gotten better taste out of it. I don’t think I could choose a favorite out of this dish as everything tasted just blah to me. 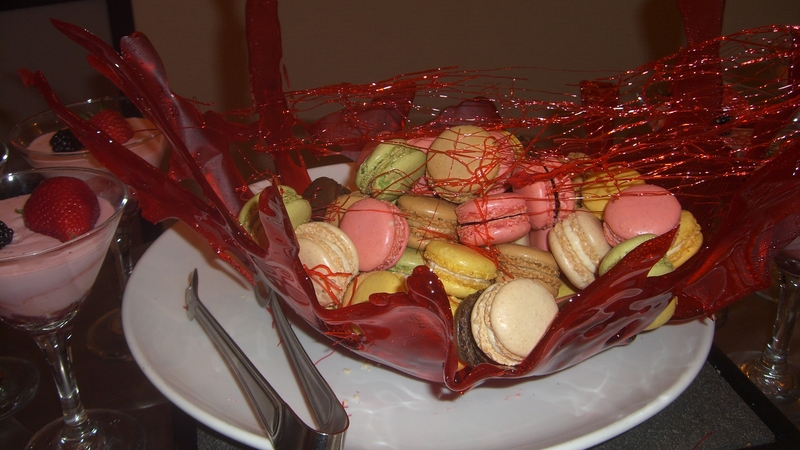 Finally, what I’ve been waiting for all night….DESSERT! 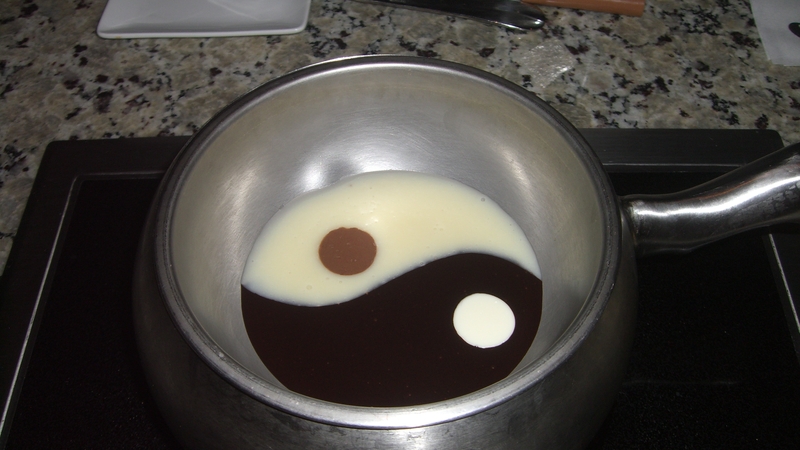 We went with the Yin Yang chocolate fondue. Half dark chocolate and half white chocolate. I’m a huge fan of white chocolate. I swear I could have just eaten that plain by the spoonfuls. MMM..MMM GOOD! 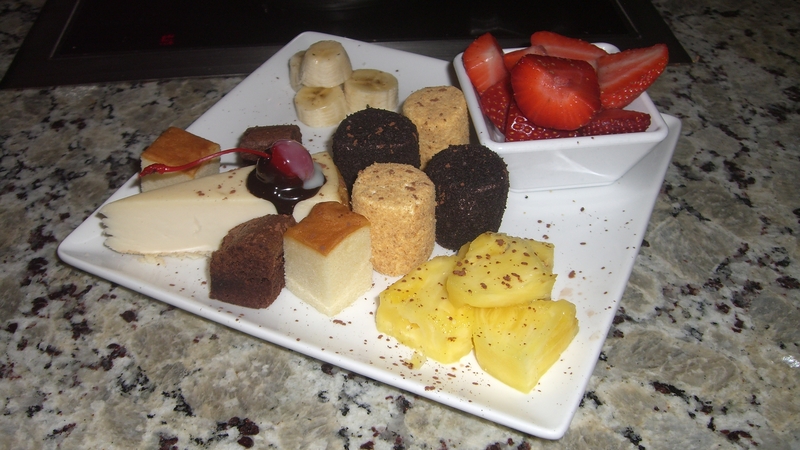 This dessert came with (from bottom going clockwise) some pineapples, cheesecake, pound cake (on both sides of the cheesecake), bananas, strawberries and coated marshmallows (middle). This was way more than enough dessert for the two of us. The marshmallows were my least favorite as they were too sweet, and I’ve got quite a sweet tooth. I’d have to say I liked the bananas the most. Oh and because I love white chocolate, we tried to keep the chocolates from mixing so I found that the strawberries with the dark chocolate were the perfect match. If you missed my last post and you want a great “food read’, be sure to check out this spectacular post written by Valerie @ A Canadian Foodie. Best blog post I’ve read so far. If you’re here looking for your blogger award that I notified you about then click here. And don’t forget to check in on my giveaways page every now and then. Well I’m off to enjoy the rest of my weekend with my family and some friends visiting from Vietnam. Hope you all have a wonderful weekend. Until next time friends and family. Anyways, on with business. I was honored to receive this Happy 101 award recently. What better timing than right before my birthday. So I’d like to pass this award to some of you. If you don’t want to participate I totally understand as we all have very busy lives to lead. But I just wanted to pass this on to let you know how much I appreciate your blogs and for helping bring some smiles and laughter into my life. Thanks for allowing me to live life vicariously through all your blogs. Bloggie friends rock! 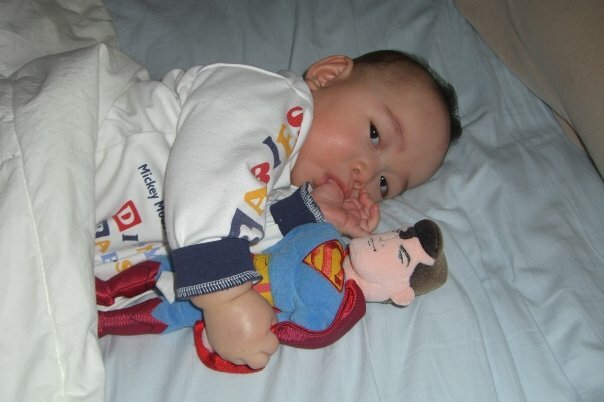 This award is from Melissa @ Mommy Living the Life of Riley. 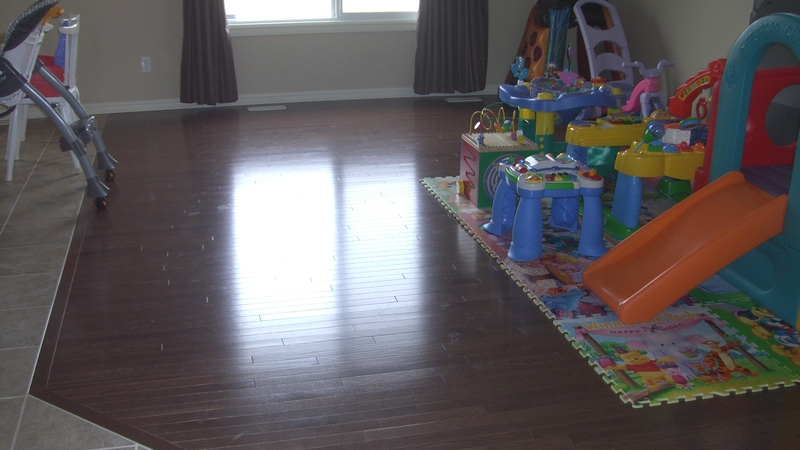 Check out all of the great thoughts, freebies and giveaways she has listed on her site! The laughter and smiles on children’s faces. 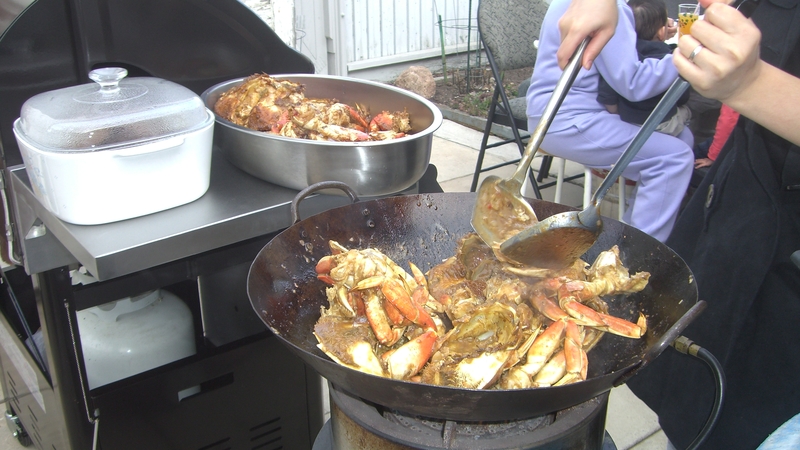 Also if you’re looking for a great “food read”, check out Valerie’s post at A Canadian Foodie. This was truly one of the best posts I’ve ever read. Talk about living life vicariously through other’s blogs. Okay, I’m off to spread the good news! Have a great day! Don’t forget to check out my giveaways page. Custard Shrimpfu Surf and Tuft…Say What? On Sunday I started feeling better so that day was dedicated to getting things back in order. The OCD in me couldn’t take it anymore. The laundry got done, floors got swept, vacuumed, and swiffered, dishes got washed, every countertop got wiped down and sanitized, garbage got taken out, and the fridge, microwave, and range all got cleaned as well. The only thing that didn’t get cleaned were the toilets. Maybe I’ll leave that for the hubby keekeekee. So much better wouldn’t cha say?! Phew, I never wanna get sick again. Oh speaking of getting sick, how many of you get your yearly flu shots? I usually don’t get the flu shot and I’m usually fine. I think the longest I went was 3 years without having a cold. But this past Christmas we went on a cruise with the little ones, so not wanting to take any risks we all got our H1N1 shots, plus the flu shots, plus whatever else shots we had to get. As soon as we got back from the cruise I got sick. It was almost like the flu shot weakened my immune system…hmmm…go figure. So from now on I’m not getting a flu shot. Anyone else experience the same thing? 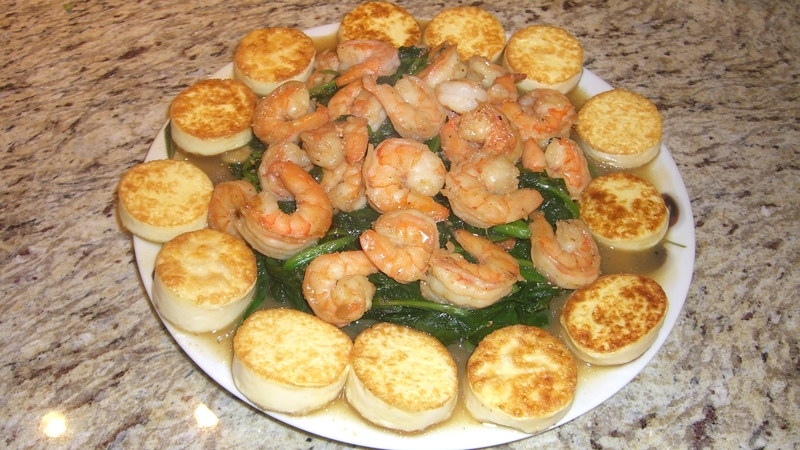 Anyways, here’s the recipe to that tofu, spinach, and shrimp dish I told you I would post. 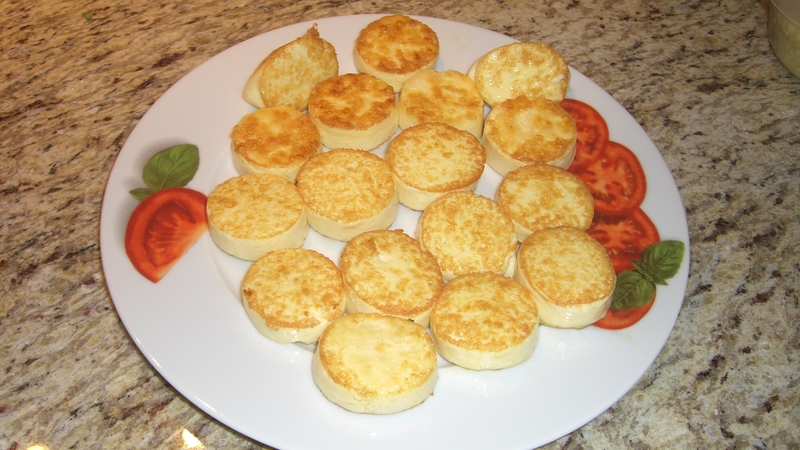 This dish, like the other dishes I make is very easy and non time-consuming. My dishes have to be simple and easy cause I don’t think my brain could handle more than 5 ingredients. Teehee. I wished I could create such delectable and uniquely wonderful dishes like many of you do but the simplicity of my klutzy brain doesn’t allow for that. So with that said I’m proud to share this simple recipe with you. And by the way, these measurements are just a guideline as to approximately how much you can use of each ingredient. 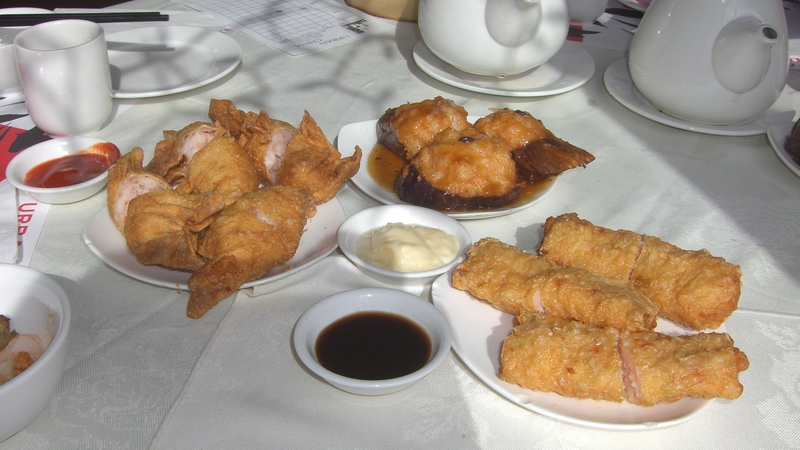 If you’ve experienced trying to learn Chinese cooking, you’ll agree it’s usually a bit of this, a little of that, a dash of this, a drizzle of that type measurements rather than the teaspoons/cups measurement. 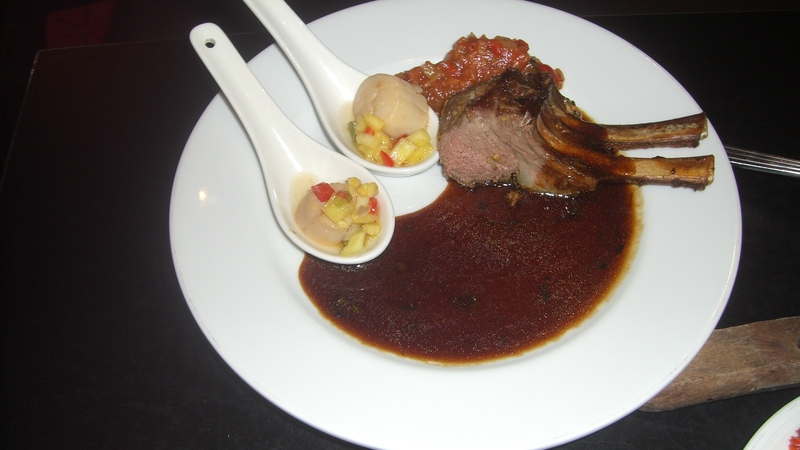 In a small bowl mix all the sauce ingredients together and stir until you achieve a smooth consistency. Set aside for later use. Slice tofu into approximately 1 inch thick slices. This is the type of tofu I like to use. 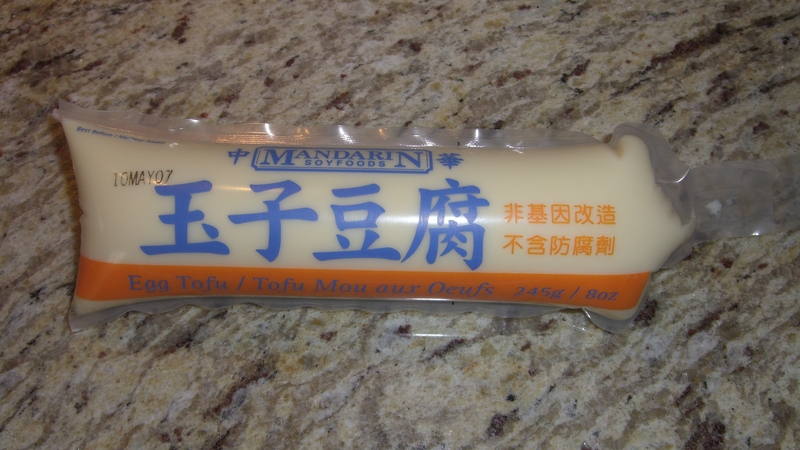 I luv luv luv this tofu because the egg inside gives it a custard-like taste and texture. If you’re allergic to eggs there is another type that doesn’t have eggs. I’m pretty sure you can get these at any Chinese supermarket. In a pan or wok heat up 2 teaspoons of cooking oil on high heat and pan-fry the tofu on each side until a golden brown colour. Take out the tofu and place them on a plate for later use. Yeah yeah, so I need a little work on making my slices evenly sized. In a pan or wok heat up 1 tablespoon of cooking oil on high heat. Add 1 teaspoon of chopped garlic. Cook till the garlic turns a golden brown colour and throw in the shrimp. 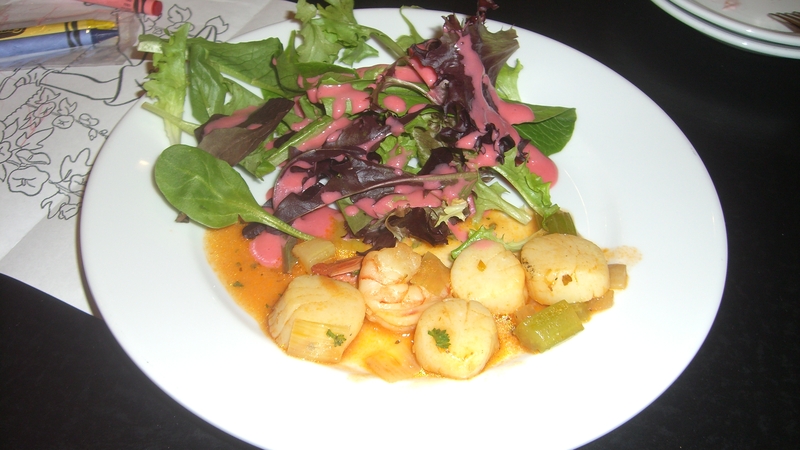 Toss the shrimp around until they are 3/4 cooked (pink, translucent colour). 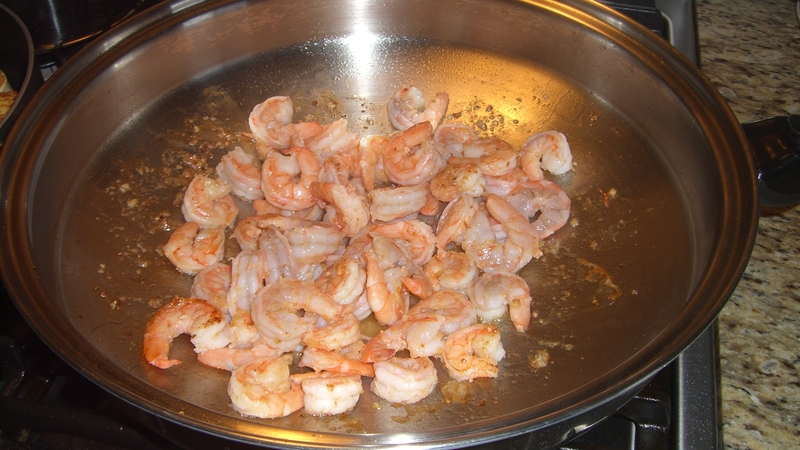 Scoop out the shrimp onto a plate and set aside for later use. In a wok heat up 2 tablespoons of cooking oil on high heat and add 1 tablespoon of chopped garlic. Cook until the garlic turns a golden brown colour. Throw in 2 bunches of spinach, add 3 tablespoons of white cooking wine and cook for about 3 minutes. 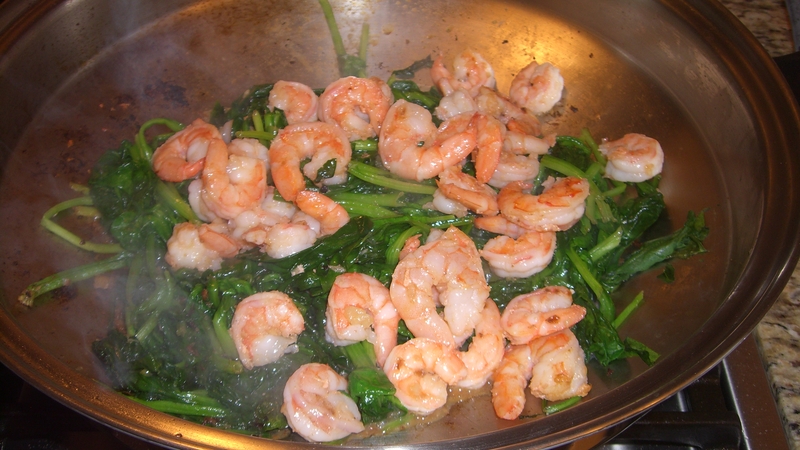 Once the spinach is cooked, throw the shrimp into the same wok as the cooked spinach. Pour in the sauce mixture. Cook and toss together for about 2 minutes or until the sauce coats everything. Turn off the heat and plate. 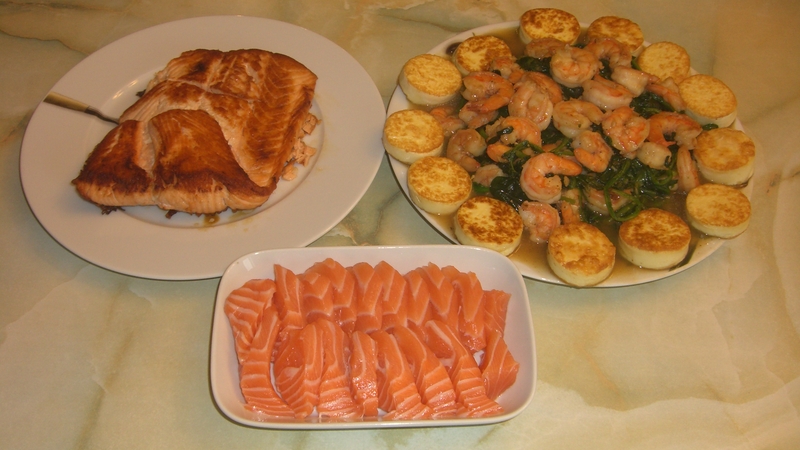 And here’s the rest of our dinner: pan-fried salmon which we like to just dip in Worcestershire sauce, and salmon sashimi. With white rice of course. So just a few things before I leave. I’ve added a giveaways page at the top of my blog to help support my fellow blog friends. Rather than having to go back and add links to my posts, I can just add giveaways to this page. So please check that page every so often for new giveaways. I’ve seen a page like this on some of your blogs so I thought I’d steal the idea, thanks for the idea guys. If you don’t see your giveaway on the page please feel free to shoot me an email lynnchenrocks@hotmail.com with the link to your giveaway and I’d be glad to add it. Hope you’re all having a wonderful start to your week. Until next time friends and family.